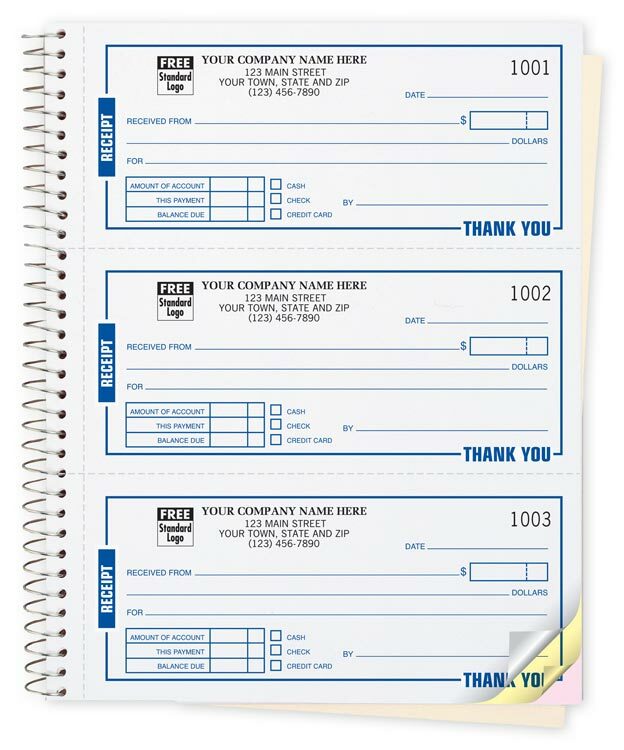 Carbonless Receipt Books with spiral wire binding. Made of a sturdy 125# manila cover, the back cover is a wraparound flap to slip between the sheets when writing. Books feature preprinted areas that document payment, payment method & account balance. Bottom copy stays bound in book for a permanent record. Book size is: 6-3/4" x 8-1/2"
Your personalization options shown in steps 1 and 2 using standard default type styles / fonts, sizes and type positioning (regardless of your provided sample) on this standard product template item number. If you require a specific look, please provide the artwork for this order. The imprint area is 2-7/8 (2-29/32) wide X 9/16 tall.